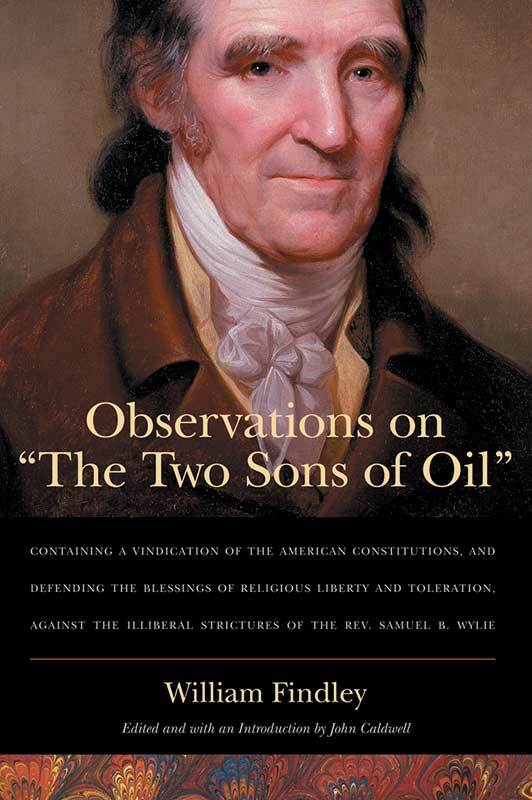 Observations on “The Two Sons of Oil” was written in 1811 in response to the Reverend Samuel B. Wylie’s work, The Two Sons of Oil, which was published in 1803. In this work of radical Presbyterian theology, Wylie pointed out what he considered to be deficiencies in the constitutions of both Pennsylvania and the United States and declared them to be immoral. Findley’s response to Wylie’s criticisms in Observations showed that it was neither the purpose nor the design of the United States government to have a federal religion and a federal creed. In a broader sense the book is also a passionate defense of a civil government guided by moral principles that allow for essential freedoms. William Findley was born in Ireland and emigrated to Pennsylvania in 1763. He served in the Second through the Fifth Congresses, and again in the Eighth through the Fourteenth Congresses, earning the designation “Father of the House” before he retired from Congress in 1817. He died in 1821. John Caldwell is retired from Augustana College, where he was Director of the Library and Professor of History. Himself a native of western Pennsylvania, Professor Caldwell is the author of George R. Stewart (1981) and William Findley from West of the Mountains: A Politician in Pennsylvania, 1783–1791 (2000). Introduction, annotations, an index of biblical citations, index.